Photos courtesy of Jane Haigh. Chatanika Gold Dredge No. 3, outside of Fairbanks, is seen before being scorched in a fire in August 2013. 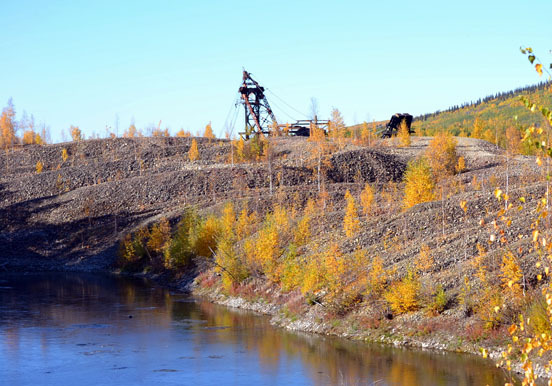 The dredge is co-owned by Jane Haigh, of Soldotna, who bought it to try and preserve this 70-year-old, 300-foot piece of gold mining history. It was a quintessential impulse buy: completely unplanned, wholly unpractical, outside the bounds of discretionary spending, yet completely irresistible. That was the response of Jane Haigh, of Soldotna, upon seeing a classified ad in the Fairbanks Daily News-Miner in 1997. The object of her desire? Not a snowmachine, nor a fish smoker. Neither a hot tub, backcountry cabin, sport boat or any of the myriad other items for which Alaskans develop itchy spending fingers. 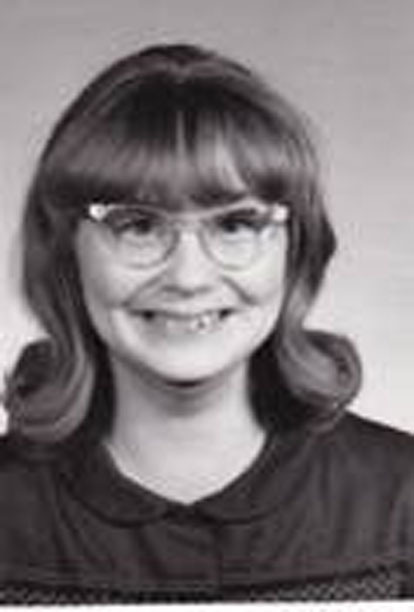 Here’s a hint: At the time, she was a mining historian, living in Fairbanks since 1970 (and now is a history professor at Kenai Peninsula College’s Kenai River Campus). Here’s another: It’s bigger than a breadbox. Much bigger. 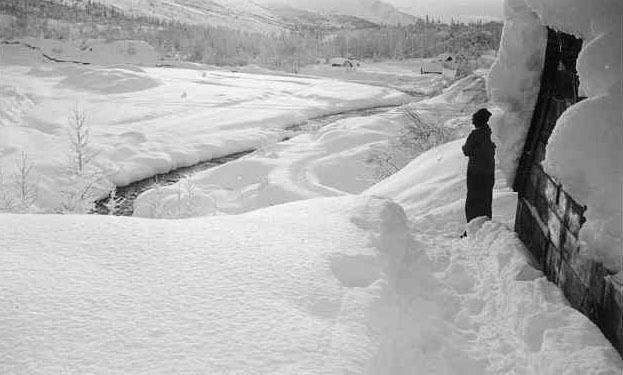 Possibly bigger than the manufacturing machinery that made breadboxes, and was employed in significantly altering miles upon miles of Alaska’s landscape and hydrology. “I’m a mining historian, so I knew about gold mining in Alaska and I’d been fascinated with gold dredges for years. And they had an ad in the paper,” Haigh said. 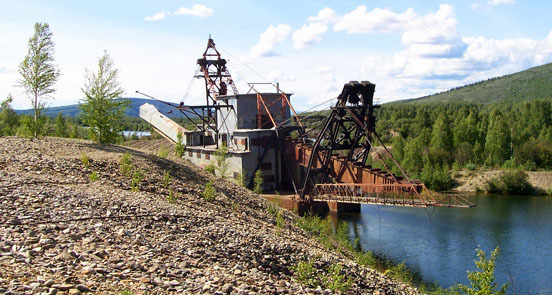 For sale: One ginormous, intact but inoperable, metal-and-wood hulking hydraulic relic at Mile 29 Steese Highway, complete with 50 acres of scraped-out pond and machine-made corduroy tailings mounds, a testament to the power and prevalence of the 1920s industrial gold mining boom in Alaska. Or something like that. Whatever the wording, even if simply, “Chatanika Gold Dredge No. 3 for sale,” Haigh was intrigued and mentioned it to another history-minded friend, Patricia Peirsol. They marshaled the finances to purchase the dredge and surrounding property. In terms of monetary value, it wasn’t much of an investment, and they had no particular plan for the dredge. They weren’t hoping to open a tourist attraction, make it into some kind of TV show-worthy extreme home or sell it off piece by piece. Exactly the opposite. They bought it to do nothing with it, so no one else would try any of those things, and the history would remain just as it was. “I didn’t want anybody to turn it into a restaurant or RV park, which is what people were talking about. We didn’t want that to happen, so we thought, ‘We’ll just protect it by buying it.’ It was kind of a thing of, ‘Well, if we owned it, it wouldn’t be lost,’” Haigh said. Or moved, or massively transformed, which, to a historian, is another kind of loss. Trying more than succeeding sometimes, it feels like. Haigh can rattle off physical reminders of Fairbanks’ gold-era beginnings that are now gone — historic cabins, coal bunkers, the Northern Commercial Co. general store downtown that dated back to the turn of the century. The dredge had a significant effect on the topography of the Chatanika valley, dredging out a pond covering the valley floor, scooping up buckets full of gravel and depositing the tailings into huge new mounds. 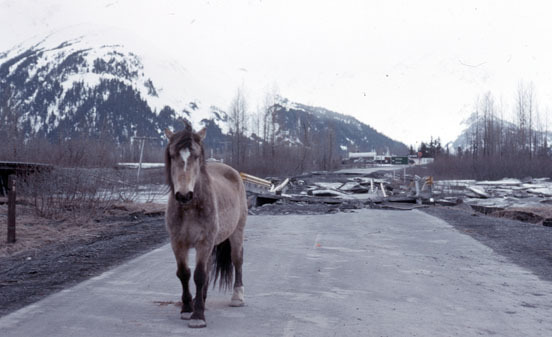 Even though the dredge was damaged in a fire, the area itself still has value as a peek into Alaska’s early industrial gold-mining era, said Jane Haigh, co-owner of the dredge. They approached prospective partners and mined some potential funding veins, but none panned out. So they just did it, bought 50 acres of tailings mounds and a nearly 70-year-old, 300-foot industrial mining relic. Sixteen years later, on Aug. 3, 2013, their aspirations of preservation went up in smoke. Photos by Jenny Neyman, Redoubt Reporter. 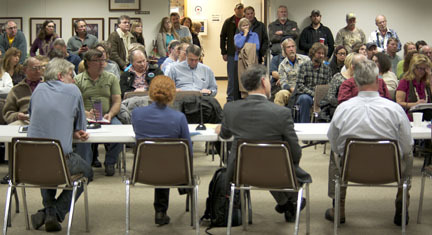 Central Kenai Peninsula residents packed the Kenai Peninsula Borough Assembly Chambers on Monday evening to testify about House Bill 77, which proposes several changes to Alaska Department of Natural Resources statues governing public involvement, water reservations, land exchanges and other controversial issues. If the Alaska Department of Natural Resources’ intentions behind a bill meant to streamline permitting processes, as explained by Deputy Commissioner Ed Fogels at a meeting Monday evening in Soldotna, were specifically spelled out in the text of the legislation, perhaps Alaskans wouldn’t be quite so opposed to it. But in its current form, with imprecise language opening the door to interpretation, all 42 central peninsula residents to speak about House Bill 77 did so in opposition, some advocating changes to make the measure more palatable, while many others requested shutting the door on the bill altogether. “Democracy is not efficient, it is sort of messy. And dictatorship is real efficient, they cut right to the chase, and in the long run it might not work too well as we all know,” said Marge Hays, of Kasilof. Of all the specific concerns voiced about the bill — protection of fish-bearing waters, opportunity for public participation in the permitting process, rules governing land exchanges, and others — the common thread was trust. Namely, a lack of it. On the more lenient end of that spectrum is taking DNR at its word when it comes to some of the more nebulously worded sticking points in the bill, but being concerned that future administrations won’t uphold the intentions of the current one. “If you’re saying, ‘This is our intent,’ you better make sure that it says, ‘This is what we’re going to do,’ because none of the commissioners, none of the deputy commissioners are going to be here forever. Sometime down the road we’re going to say, ‘What did we really want to do with this law?’ It’s got to be written out, that’s the way the law works. If it doesn’t say it in the law, then it’s not going to be followed down the road,” said Dr. David Wartinbee, a biology professor at Kenai Peninsula College and an attorney. Dave Athons, retired Fish and Game biologist, testifies about his concerns with the bill. The other end of the public trust spectrum holds an unwillingness to extend the benefit of the doubt to the bill as written, those who would carry out the new regulations, nor administrations to come. “It seems like it’s purposefully vague and open to interpretation. It seems like we’re being asked to put too much trust in people in administrative positions,” said Eric Treider, an oilfield worker, of Soldotna. The Monday meeting, and another Tuesday evening in Homer, was organized by Sen. Peter Micciche, R-District O, who said that he has received more correspondences about HB77 than any other issue since being elected in 2012. Another meeting is scheduled from 6 to 8 p.m. Wednesday at the Alaska Experience Theater in Anchorage. The bill passed the House and finished the last legislative session in the Senate Rules Committee. It was submitted by Gov. Sean Parnell and drafted by the DNR and Department of Law, and is expected to be revived next session. Given the amount of controversy that’s developed around the bill, Micciche said that he wanted an opportunity for his constituents to hear from administration representatives — Fogels and Alaska Department of Fish and Game Commissioner Cora Campbell — and be able to air their concerns. Photo courtesy of by Jeanne Devon, The Mudflats. Wetlands at the proposed Chuitna coal strip-mining site near Beluga on the west side of Cook Inlet. A recent petition to make certain lands in the Chuitna watershed a mine-free zone was rejected by the Department of Natural Resources on July 26, with the state agency citing a lack of evidence supporting the claim that reclamation of salmon streams is impossible. Ed Fogels, the department’s Deputy Commissioner, said a high stack of papers on stream reclamation sits on his desk on the technical aspects of stream restoration. It’s a whole science these days, he said. “This is not just some bulldozer operator cutting a V-notch in a pile of dirt,” Fogels said, adding that while the expectation isn’t that restoration will return streams to 100 percent of its former state, the technology is there now to restore streams and wetlands to a functional state. But those opposed to the Chuitna Coal Project, a surface mine proposed near Tyonek on the west side of the Cook Inlet that includes the removal of 11 miles of streambed where salmon have been documented, say it’s impossible to reclaim a stream and protect the salmon that use it after mining. 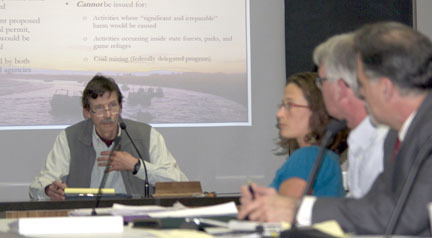 They cite testimony from Margaret Palmer, director of the National Science Foundation’s Socio-Environmental Synthesis Center, who testified before an Alaska Senate committee that the impacts on the salmon stream will be irreversible and that large-scale failure at Chuitna is inevitable under the proposed plan. The state’s current administration is putting mining and development ahead of salmon fishermen by not protecting the Chuitna River and its tributaries, they say. “This is a horrible precedent for Alaska wild salmon and the countless families they support. 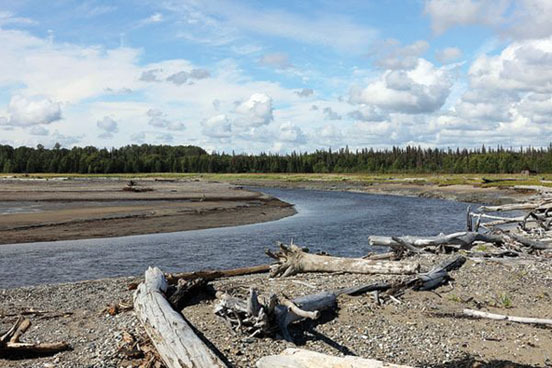 PacRim Coal’s mining plans would remove miles and miles of wild Alaska salmon streams to a depth of over 300 feet,” said Judy Heilman, president of the Chuitna Citizens Coalition, in a release. “The Alaska Department of Fish and Game calls the tributaries PacRim would remove as important to salmon, yet the state refuses to formally protect our wild salmon streams,” Heilman said. The back and forth between citizens groups opposed to the Chuitna Coal Project, which include the coalition and Cook InletKeeper, has been going on for several years, since PacRim Coal started the process of applying for permits for the mine. The state is currently working with PacRim Coal on its environmental impact statement, which is expected to take another year before state agencies get a chance to comment, Fogels said. Photos courtesy of Phil North. 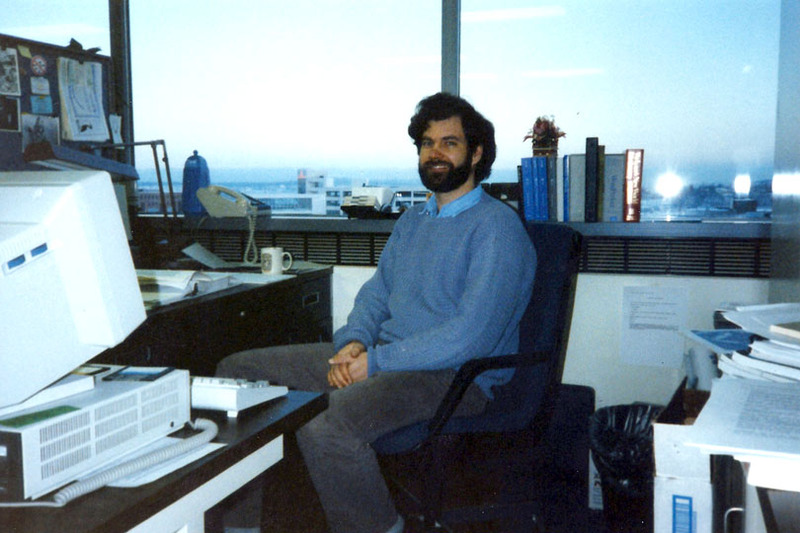 Phil North in his EPA office in Anchorage, his first station in Alaska, before moving to Kenai in 1998. 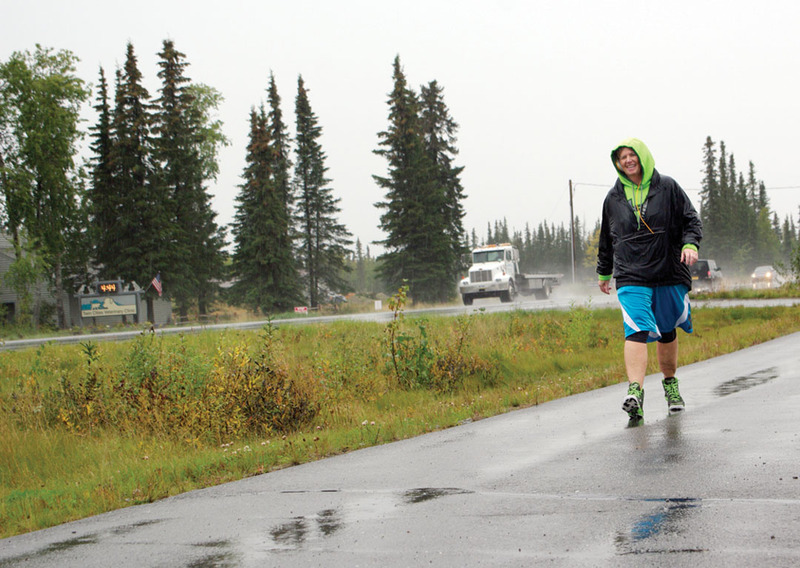 Kenai’s Phil North’s first impression of Bristol Bay was only a hint of the place. Like fin tips rippling the surface of the water — aware of the fish, but not equipped to judge the potential magnitude of it, hidden from view. Sure, there were salmon. Otherwise he wouldn’t be there, as an 18-year-old crewing on his uncle’s tender. Presumably a lot of salmon, or else Bristol Bay wouldn’t have been the first stop of season, important enough to dictate the timeline for loading up cargo and heading out of Seattle in order to get to South Naknek for the first fishing opener of the spring. It was a favorite spot personally, being one of the few stops of the summer where North got the chance to get off the boat and hike, feasting his interests in botany and biology on the bounty existing there. But it wouldn’t be until he was nearing the end of his 20-plus-year career with the Environmental Protection Agency in Alaska that he realized the scope of the place. Not just lots of salmon, but the healthiest wild salmon runs left in the world. Not just ample biodiversity, but one of the few remaining intact, untampered-with watershed systems. A fishery that not only helped pay his summer wage, but that generates $1.5 billion annually in output or sales value across the United States, according to a recent Institute of Social and Economic Research report, and supports local residents socially, spiritually and culturally, as well. “It was really an enjoyable time and I have fond memories of being there. But when I was doing that I did not really understand. I knew there were a lot of fish, but I’d never seen the rest of the watershed, and I didn’t really have an appreciation of what a special place Bristol Bay is,” North said. It took about 30 years and the prospect of one of the largest copper mines the world has yet seen digging into the area around the headwaters of that watershed for North to come to realize how special a place Bristol Bay is. And why, to his mind, it needs protection beyond what the companies and state of Alaska would afford. To the point of pulling the EPA’s potent and rarely used trump card — a 404(c) designation under the federal Clean Water Act, which could limit mining in the area before a specific proposal is even submitted. 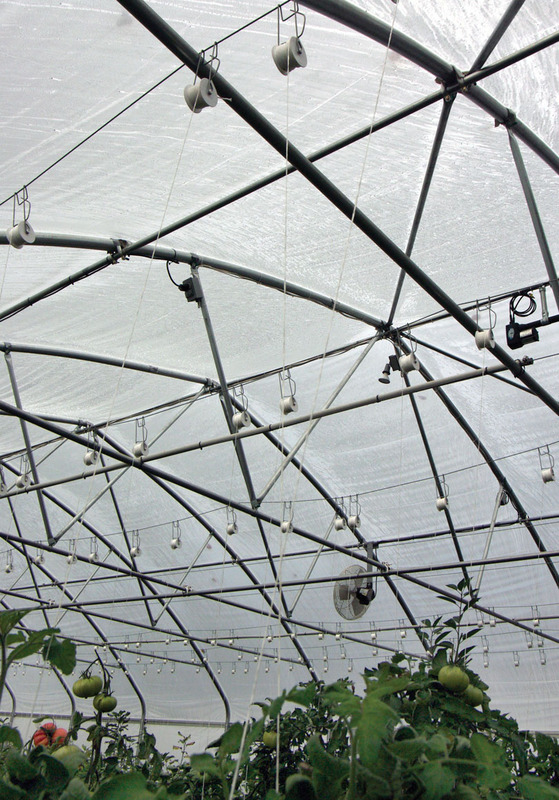 “It really takes an exceptional situation for it to be used. But when I started talking about it with people, almost everybody said, ‘If there’s anyplace this should be done, it’s Bristol Bay,’ because there’s no place on Earth like Bristol Bay. It really is the last of the great places for salmon,” he said. Editor’s note: This is the third part of a three-part story concerning the Manitoba cabin at about Milepost 50 of the Seward Highway. Two weeks ago, Part One explored the contentiousness between the U.S. Forest Service and the owners of the cabin and its nearby mining claims. Last week, Part Two examined the earliest mining history related to the cabin and its likely progression of ownership. This week discusses the debate over the historic value of the cabin. Next week, the cabin gets a brand-new lease on life and recreational use. Photos courtesy of Theresa Zimmerman. Lenore Robbins and her dog, Judy, stand alongside her snow-covered Manitoba cabin in the 1940s. One of the least well-remembered chapters in the history of the Manitoba cabin concerns its startling brief ownership by Dr. Steven Harris. 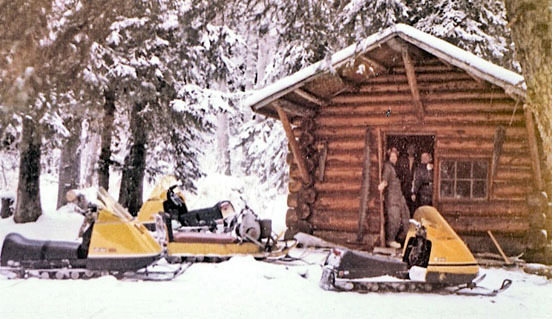 On Jan. 21, 1976, the Manitoba cabin — part of claims A, B and C of what by then had become known as the Good Rock Claims — were conveyed to Dr. Harris by owners Michael “Whitey” and Patricia “Mickey” Van Deusen. 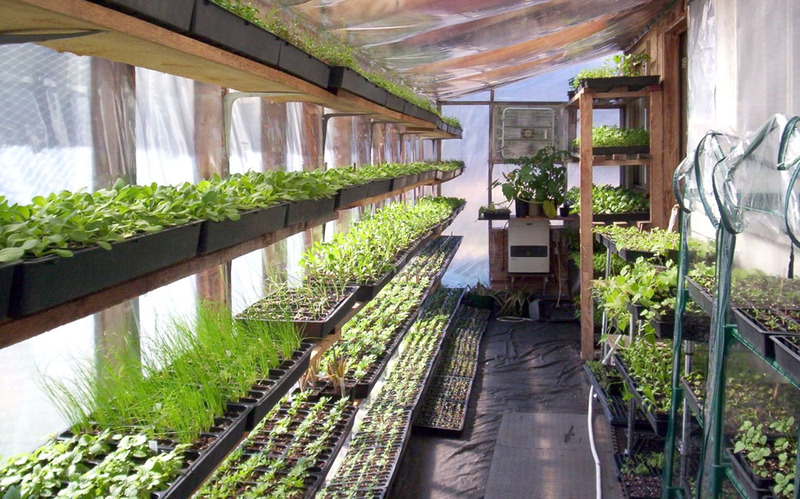 Shortly thereafter, Harris was contacted by U.S. Forest Service officials, who wanted him to know of pending class-action legal proceedings against the property. About three years earlier, Wesley Moulton of the U.S. Department of the Interior had performed a “geological examination” of the claims in question in order to determine their mineral potential. Although former owner Willard Dunham disputed the authenticity of the examination, Moulton’s findings were accepted by his agency. Lenore Robbins looks out from her Manitoba cabin property toward cabins near the Mills-Fresno creek confluence in the 1940s. regulations stated that no mining could occur in such an area, any mining claims there could be voided. Just as the feds were about to void the Good Rock claims, however, the Dunhams put the property up for sale, and the Forest Service postponed action until a new owner took over. That new owner was the Van Deusens, who paid the Dunhams $1,750 for the property in a sale in September 1973. Almost immediately, Whitey Van Deusen filed the proper labor notices for mining operations with the Bureau of Land Management, and so the Forest Service was forced to wait again, until Dr. Harris bought the place in 1976. The Manitoba cabin was already well entrenched in family history by the time Willard and Beverly Dunham — away from the presence of their disapproving parents — got married in Fairbanks in 1951. While Beverly was in college in Oregon, she received a wire from Willard in Fairbanks to tell her that he had just won $2,000 playing craps, and he wanted her to head north and get hitched. She quit school and flew to Fairbanks to say her vows. 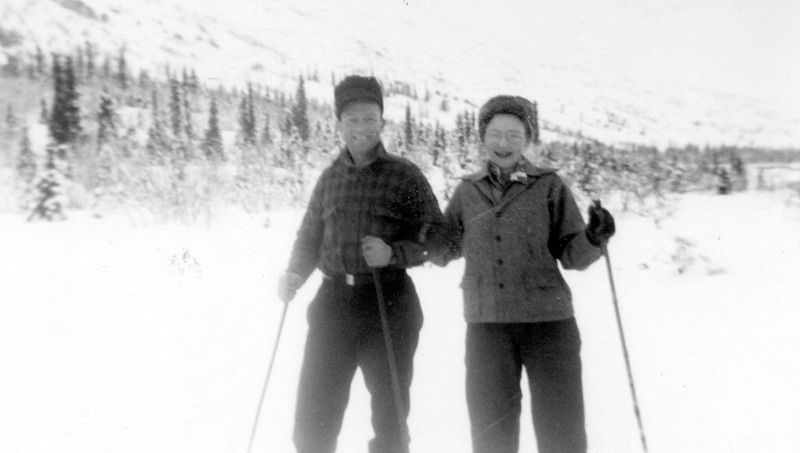 Delbert and Lenore Robbins do a little cross-country skiing, probably in the vicinity of the Mills Creek drainage. not so unhappy with Willard that they were willing to disown him. When the Robbinses, who had purchased the Manitoba cabin in 1942 from Jack and Marie Shield, decided after statehood to leave Alaska, they deeded the cabin and adjoining property in 1961 over to Willard and Beverly for a dollar. The Dunhams said they kept the property in the family for another decade before they, like Willard’s parents, tired of the U.S. Forest Service’s efforts to destroy the place, which they considered an important link to the area’s mining history. The validity of that “link” has long been a source of controversy, however. 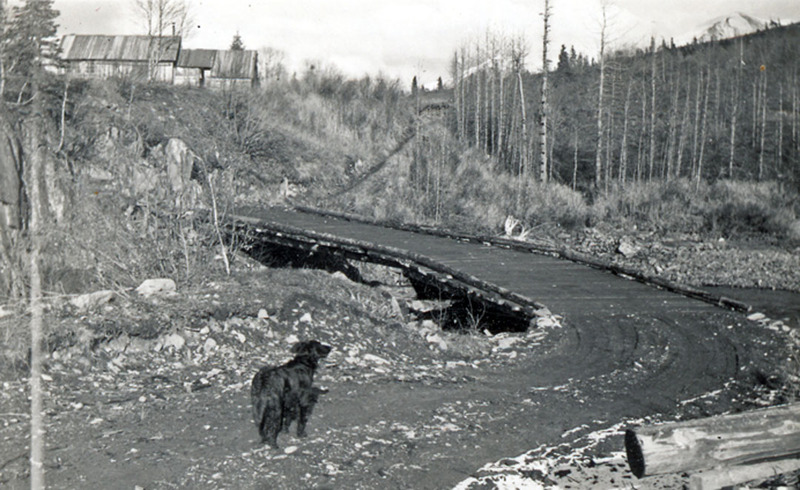 Judy, the Robbins’ family dog, prepares to race across the bridge over Mills Creek on her way up to the Manitoba cabin atop the hill. The mining history of the area begins with a confluence of gold-bearing creeks and what came to be known as the Cook Inlet Gold Rush. East of the rocky promontory upon which sits the Manitoba cabin, Juneau and Mills creeks unite to travel westward into Fresno Creek to form Canyon Creek, which then tumbles through a jagged gorge before descending northward toward Sixmile Creek near the Hope Road. All of these creeks began receiving heavy mining pressure starting in about 1895. According to Mary Barry in her book, “A Mining History of the Kenai Peninsula, Alaska,” Mills Creek was named for Sanford J. Mills, who acted as recorder for the Sunrise District and had planned to locate gold claims on the stream named for him. After he changed his mind and abandoned his claim in July 1895, opportunities arose for mining partners Robert Michaelson and John Renner, who came to Mills Creek and found coarse gold.